I have found kitchen as a place where you can explore and explore many aspects regarding cooking, cleaning or any life saving hacks. It not only food that matters, there are many different factors added to it. Don't you feel so? When I initially started cooking after marriage, I used to know nothing must say as compared to today. I had never tried to learn even basic recipes but true, had an idea of all recipes as mom is a splendid cook. I had always relied on her homemade masala powders but gradually as I moved to US, I had no access to mom's masala powders frequently and so started to make it at home with her guidance.There are many podis( spice powders) used in our kitchen in different recipes based on the region or the state you belong to. Though all these spices and spice powders are available in the markets these days but I prefer not to buy any of the spices in the powdered form as you never know what goes into it. Though they may be fresh when packed but as it takes time to reach us, the flavors are very less. Have you noticed that a curry made with freshly roasted spices is so aromatic rather than adding the store brought spice powders?? Yes,it definitely takes the same dish to new level. 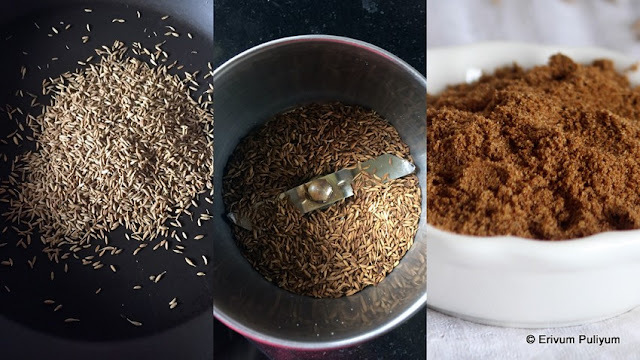 I have been making garam masala, sambar powder, rasam powder, kayam(hing) podi, uluva(fenugreek)podi, jeeraka(cumin) podi and chukku(dry ginger) podi, kurumulakku(pepper) podi since long at home. I know many of you may be practising the same at home too but this post is definitely for all the newly weds, beginners in kitchen so that they have a fair idea of the same. My mom used to make all this at home and I am carrying the same habit. I just prepare small batches so that the flavour is not lost. I have been using all these podis in many of my Kerala dishes and so thought to make a post for all these spice powders. Do save this page and keep it as a reference whenever you need to give it a try. 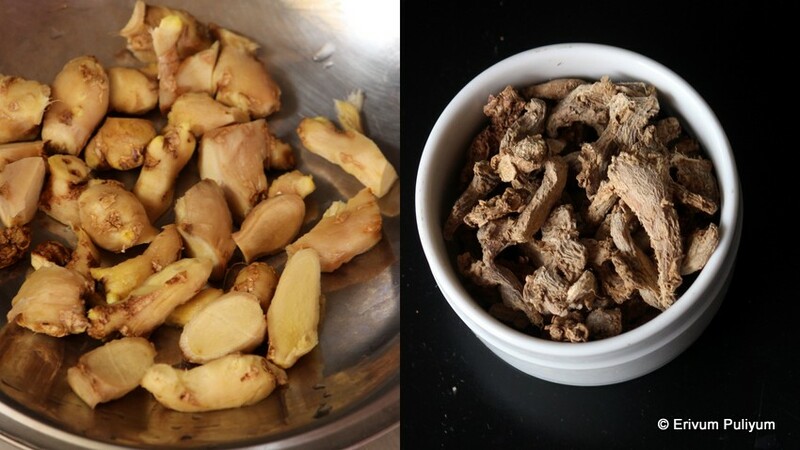 Wash and peel the skin of ginger. Cut in small pieces and sun dry for a week till it is reduced, shrinked and dried as in the pic. Flavorful chukku is ready for use. Use it in chukku kappi or any other dishes. The amount of ginger to be dried depends on your need and requirement completely and note that the ginger once dried is reduced to less than half the amount when it becomes chukku(dry ginger). Powder the dry ginger(chukku) in a clean dry blender jar. Blend until smooth, there may be dry strands of ginger, it is perfectly okay to have that. Store in air tight containers. 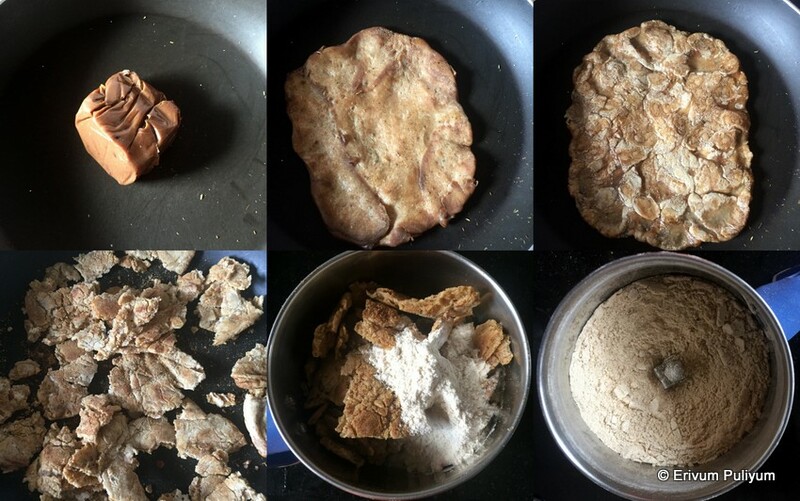 In a pan, place the compound asafoetida or roll the asafoetida on a chapathi maker with a rolling pin ( it is pliable and so easy to be flattened).If the compound asafoetida is hard, then heat a little on low flame to make it pliable. Then heat both sides of the flattened piece till its lightly browned and turns white as you do. The inner layer feels wet and stretches like melted cheese. If you can break in pieces then go ahead and do it as it becomes easier to dry roast the compound. Once it is crisp,turn off heat. Leave to cool and then in a dry blender jar, add the pieces and wheat flour/ maida. Powder it up until smooth. Leave to cool completely before storing in air tight containers. PS : The kayam pieces sticks to the blades and mixer if you don't add the wheat flour or maida. Generally the kayam podi that we buy from super markets use maida but I tried using wheat flour and it worked fine. Use whichever as desired. Heat a pan and dry roast half a cup of pepper corns. Leave to cool and then powder until smooth. Store in air tight containers. Heat half a cup of fenugreek seeds in a pan on low heat. Wait till it starts to pop, keep stirring frequently. When its lightly browned. Switch off flame and leave to cool. Powder the fenugreek seeds once cooled in a dry,moisture free jar. Leave to cool completely before storing in air tight containers. The recipes that use uluva podi(fenugreek powder) are moru curry, egg masala, pickle powders, mambazha pullisery, spicy fish curry, sweet mango curry. Dry roast half cup of cumin seeds in a pan until it starts to pop. Keep flame on low else it may get burned. Switch off flame and leave to cool. Blend in a dry mixer jar until smooth and store in air tight containers. 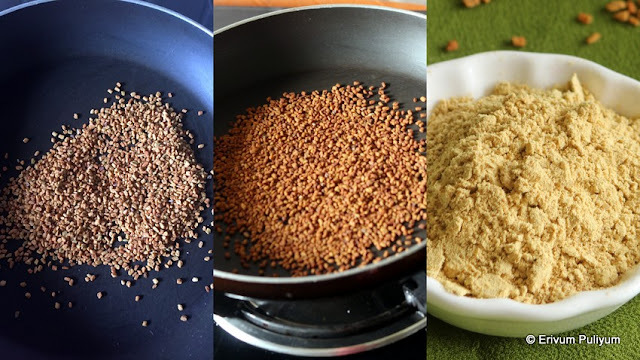 The recipes that use roasted cumin powder are sharkara varetti, chakka kumbilappam, chakka varetti, chakka ada. * Make sure to use clean dry spoons each time to use these spice powders or just leave small ice cream spoons to take out these spices each time. * Keep the jars or containers air tight so that the flavour is locked well.